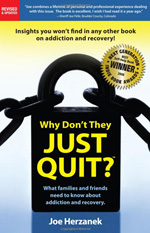 This life-changing, award winning book is a proven resource for family and friends, giving practical solutions and the tools they need to help anyone struggling with alcohol or drugs. Although there are many books available to help the recovering person, there are very few that speak to those on the "outside", who want to help, but don't know where to begin. This could be just the resource they are looking for. "Just got my books. I'm previewing it and just hit a "Thank you, Lord!" moment on page 105 about raising the bottom. I have wondered about that idea for some time now, but couldn't seem to find professionals nor support groups who I felt were smart enough to answer my questions. I could continue, but to keep it short: Bless you all for putting out these resources!" Proven solutions that can be used now! and not so common questions.